At an emergency meeting Monday night, the New Beginnings Schools Foundation board placed CEO Michelle Blouin-Williams on paid leave pending the outcome of an independent investigation into allegations of grade inflation and falsifying public documents related to a bus contract. After speaking with staff and students, Gang said it became “abundantly clear” they needed an independent investigation. He said it was especially important for the school’s families and students. “They deserve to know exactly what is going on in this organization with full transparency and accountability,” Gang said. 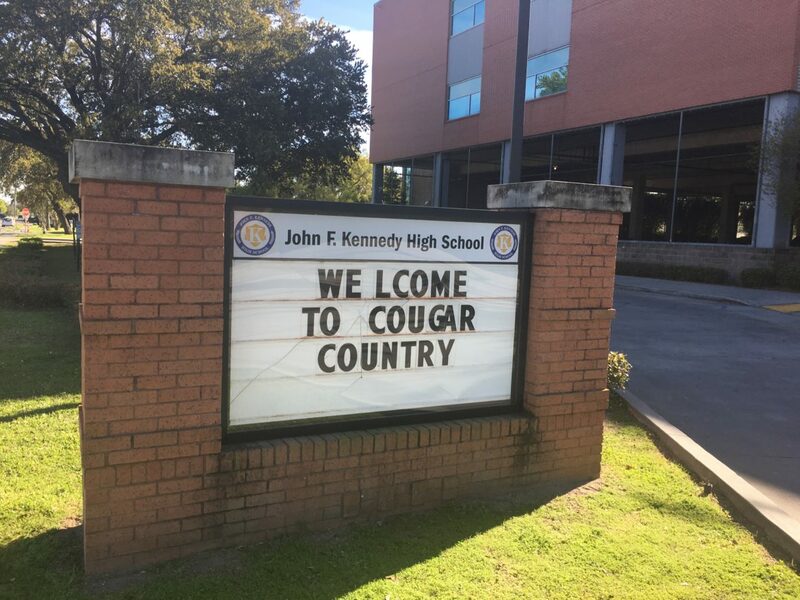 The charter network has faced growing scrutiny in the last two weeks after a former network-level employee brought allegations of grade inflation at John F. Kennedy High School at Lake Area to The Lens. Blouin-Williams has also been accused of doctoring board meeting minutes to falsely reflect that the board approved a lucrative contract with the Scholars First bus company. WWLTV’s David Hammer approached Blouin-Williams about the allegations but she wouldn’t answer questions. A wastewater assimilation project developed by the Sewerage & Water Board has cost about $9 million since 2007 — but the utility has yet to discharge a single gallon of treated wastewater. The effort was heavily promoted by the S&WB and the city of New Orleans in years past. The agency and the city announced in November 2011 that they were partnering with St. Bernard Parish to help rebuild the Central Wetlands around Bayou Bienvenue. Those wetlands have been severely damaged by saltwater intrusion along the Mississippi River-Gulf Outlet, dramatically so in storm surge from Hurricane Katrina in 2005. Wastewater assimilation is a concept that has been adopted by at least 11 other local governments and utilities in Louisiana since 1992. With the assimilation technique, treated wastewater is discharged at wetland sites, providing nutrients such as nitrogen to the area and fostering vegetative growth and soil accumulation while hindering saltwater intrusion. “The project we are beginning today fits in perfectly with what I said at my inauguration, ‘It’s time to declare that we are no longer recovering, we are no longer building … now we are creating,’” said then-Mayor Mitch Landrieu at a 2011 groundbreaking ceremony for the S&WB’s Wetlands Assimilation Project. The Orleans Parish school district is nearly finished installing filters to remove lead from drinking water at Homer A. Plessy Community School, Plessy’s principal told The Lens. And the district plans to test the school’s water for lead this Monday. The move comes one week after a seventh grader’s off-the-shelf lead test kicked the district into high gear, prompting an immediate order of filter installation. When workers came to the school earlier this week, they discovered that the water pressure was too low, and the installation would have to be delayed until pressure boosting pumps were installed. Plessy Principal Meghan Raychaudhuri told The Lens that the district received the booster pumps on Wednesday. Filter installation began on Thursday. Even with the filters installed, Raychaudhuri said she wants to “get a clear determination of possible lead” that students were exposed to. She said the district will unhook the filters to conduct the tests next week. “We agreed that in the interest and safety and well-being of students that we wanted to get a clear answer on exactly what the lead content of the water is,” she said. This week on Behind The Lens, Tom Wright goes to a rally for the “March Against Death Alley.” Michael Isaac Stein talks to Councilwoman Helena Moreno about how to change Entergy regulation in New Orleans. And we interview Berr Voss-Potts, the 13-year-old whose off-the-shelf lead test prompted the school district to install filters this week at Plessy Community School. The bathrooms are working again at Edgar P. Harney elementary school following a sewer line repair Thursday, after severe weather had kept Orleans Parish school district officials busy coordinating bathroom use for students at the Central City school. Repairs were already in progress on Wednesday. Crews were digging up the front lawn, and the school was supposed to limit bathroom use and had a portable toilet trailer outside. But heavy rains and severe weather alerts Thursday prompted the district to move the “festival-style” trailer bathrooms closer to the school and hire a contractor to install a covered walkway from the building to the trailer, Washington wrote. Opinion: When is Cantrell going to stop cuddling with the pro-monument crowd? “LaToya Cantrell has been attempting to placate both sides on this issue. And she’s been doing it right from the beginning. In my opinion, that makes her more a politician than a leader. There are times when a leader has to make a choice, when there is a right side and a wrong side. “In 1980, I got a call from two remarkable young New Orleans lawyers — Mary Howell and Pam Bayer — who asked for my assistance in what have come to be known as the Algiers 7 cases, so named because seven officers were implicated in wrongdoing, three of whom were later convicted. After a white New Orleans cop was killed in the Algiers section of New Orleans, the police had gone wild. Seeking indiscriminate revenge, they killed four black people, including a woman who was in her bathtub. They also used torture tactics later revealed to have been common practice in Chicago.